A wide range of indicators like wages, medical patents, malady and RD employment increase with the population of cities. This behaviour is often referred to as urban scaling. The interesting aspect of urban scaling is that it does not follow a straight line, doctor but rather increases exponentially. This acceleration is similar to compound interest. In some cases, the compounding can be dramatic. For example, GDP in European Cities would be expected to increase by a factor of 18.2 when population increases by a factor of 10 and by 331(!) when population increases 100-fold. People are over 3 times as productive in the larger city. Imagine a bank offering 2% interest on £1, 6% interest on £100, 18% on £10,000, and so forth. This is why cities are economic engines. This data suggests that simply moving people from a small city to a larger one would result in a net rise in GDP. In other cases, cities provide economy of scale. Fewer petrol stations are required per person in larger cities. Unfortunately, crime, like GDP, accelerates in cities. Recently, Dan Lewis, Haroldo Ribiero, and I revisited some of these issues using the crime and property information available on UKCrimeStats. The degree of resolution available in the population, crime, and property data in the UK and collated and made available on UKCrimeStats allowed us to look beyond cities to all areas of England and Wales. We were interested in a number of things. Usually it is assumed that urban scaling is uniform and does not show different behaviour at different scales. Using the bank account analogy, does the rate of compounding go on forever, or are there limits. Are there thresholds above which the rate of increase changes? Perhaps small population centres behave differently from larger ones. With the data available, we could look at the entirety of England and Wales and not just the cities. We decided to start by dividing the region made up of England and Wales by Parliamentary Constituencies. What we found ranged from very intuitive to puzzling. Let’s begin with the intuitive parts. 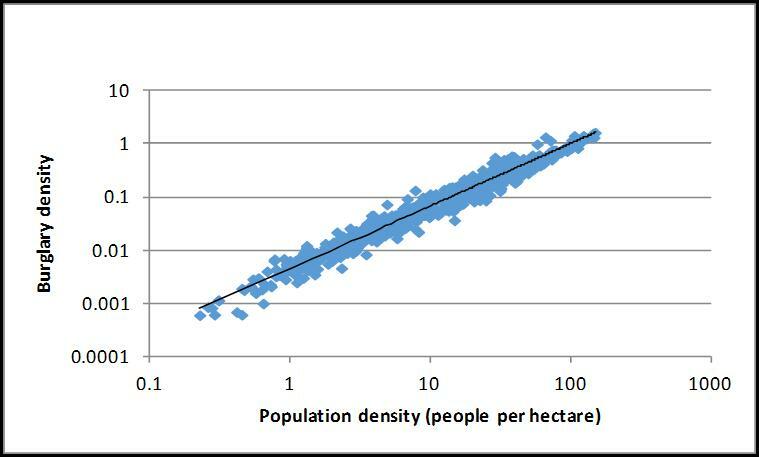 It is not so much cities that seem to be responsible for scaling behaviour but population density. This makes sense. Take burglary which is shown in the graph below. A potential burglar in a region where the only house is their own and it is 20 miles to the next dwelling is going to have few opportunities. In a densely settled area, where there are thousands of houses within walking distance there are many more opportunities. Another intuitive result involves detached houses. Detached houses, like petrol stations are subject to economies of scale at lower population densities. Above a density of about 16 people per hectare, the total value of transactions in detached housing drops. This makes sense. Large numbers of detached houses are not sustainable as population density increases. For example, 10 people living on a hectare will find themselves in very nice homes with up to 1000 square meters each. 100 people on a hectare will be more crowded with 100 square meters each. Increase the density to 1000 and each person has only 10 square meters. This has left no room for roads, shops, factories, and parks. A detached home in a high density area would require exceptional value to keep the land from being converted to higher density uses. An interesting aspect of the detached housing result was that the scaling was clearly non-uniform. A single scaling relationship could not explain everything. Less intuitive were the varying behaviours of different types of crime. Above a threshold density of 20 people per hectare Robbery increased enormously. Below the threshold, Robbery increased by a factor of 35 for a 10-fold increase in population density. However, above the threshold the factor increased from 35 to 130(!). On the other hand, shoplifting increases more rapidly below a threshold of 30 people per hectare than above. Finally, a single uniform scaling law was seen for burglary. Put another way, crime always increased with population density. One hundred people living on a single hectare will result in more crimes reported than 100 people living on 1000 hectares. A robber particularly loves a densely populated city where a shoplifter feels slightly inhibited. For a burglar a single behaviour applies to all areas. This is an overview of our findings. If you are interested in the study, the paper may be found here and some of details on the background may be found here. Just enter a postcode into the searchbox and click on the link to Property Sales. We have all transactions dating back to January 1995 and update every month, find just as with crime. We have just updated the latest price paid data from the Land Registry and matched it to every shape so you can run reports and compare areas and prices over different time periods as well as geolocate specific properties. One of the areas I’ve been watching closely is London – full page of sales here. As this chart shows which I’ve compiled, viagra sale the declining trend number of new properties build and sold in London versus the rising population is very likely a contributing factor to the declining affordability of living in London. One of the unique capabilities of UKCrimeStats is the ability to ask of the data, for sale which type of area, across the given area had the most, least, biggest increase/decrease, of this that or all types of crime weighted for daytime or residential population. We can do this with almost everything where the data is available. So we can now announce that this reporting facility has just added Northern Ireland Super Output Areas (NISOAs – equivalent of Lower Layer Super Output Areas). I was just looking at where the lowest residential crime rate area is in NI and the answer was Ardboe, half of which covers Lough Neagh and is a very large NISOA at over 2,000 hectares. At the other end of the scale is Shaftsbury_1 which unsurprisingly is right in Belfast City Centre with a much smaller geographic footprint of 113 hectares. This however does not tell the whole story because the daytime population of Shaftsbury_1 is nearly 15 times higher than the residential one, at 32,000. City centres have much higher footfalls and you have to adjust for that. And we can. So now weighted for daytime population, which NISOA and lowest and highest crime rate over the last 12 months? The highest is Botanic_3 at 584.967 and the lowest is Rostulla_2 at 6.232 crimes and ASB incidents per 1,000 daytime population. If there’s one stand-out difference, it is that Botanic 3 is just 17 hectares. I often wonder if urban planners in their quest for greater urban density are considering enough the impact that density may have on overall crime rates. Here at UKCrimeStats we spend a lot of time working on postcodes. Every few months, drugstore new postcodes are created, others are decommissioned and we then go away and do the radius calculations and all the matchings to different areas and of course crimes and property prices. So postcodes can get out of date very quickly and there’s nothing more annoying than missing a few postcodes out of a few thousand. That won’t happen with UKCrimeStats. We have also been careful to keep a record of the retired postcodes because many people unknowingly keep using them for years afterwards.